The Husqvarna Z500 zero-turn series represents the latest design focused on productivity, durability and cut quality. 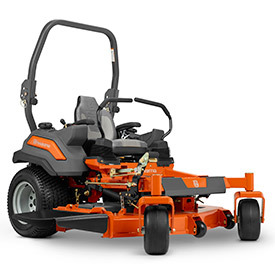 The Z500 provides extreme comfort, high ground speeds and superior traction for exceptional mowing efficiency and is built to ensure a long and productive product life. Industrial strength throughout provides a longer service life while easy serviceability is a key in the design considerations. The new series consists of eleven products, four Z500 models and seven Z500X models, and stands out with its weld-reinforced 2-in. by 3-in. tubular steel frame, 7- or 10-gauge cutting decks and 10-in. diameter spindles, all protected by Husqvarna’s industry-leading 5-year limited commercial warranty. Operator improvements include an automatic parking brake for fast and easy transitions, an easy-to-fold ROPS and easy-to-view deck height adjustment, allowing for improved operation and operator comfort. Smart design features such as tool-less fasteners, sealed and labelled fuse boxes and easy access to all major components will provide for faster and more convenient serviceability. The Z500 series also features a colored fuel gauge that lets the operator get a quick overview of fuel levels in the 12-gal. duel fuel tanks.